Fantastic job! The constant flow of traffic that you created at our booth at the Home and Garden Show exceeded my expectations. The entire staff loves you and the people around you appreciated your work! Your presence in the Meridian booth was a enormous crowd draw. It was wonderful to see vendors pouring into our booth and our message reaching their ‘”ears”. Dale worked to make our event excellent by spending time before the event researching what we do and working with us to get the most out of his services. He has an extraordinary level of energy which was to bring people into our booth space. I cannot stress enough how many compliments we received and how many attendees ask where he was once he left. Overall Excellent! My “Show Girl” Balloon hat really attracted a crowd and lots of looks. My boss didn’t think I would wear it all day, but after the great response and to just see people smile and laugh, was well worth me wearing it. 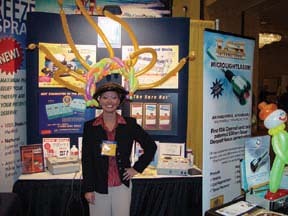 It was a huge attention getter and at such a large convention in Las Vegas, you need all the help you can get to have people stop at your booth. This “Show Girl” Balloon Hat was great and the Dale does a fantastic job, very talented & creative. Thanks for making our booth more exciting and a real show stopper. I would defiantly recommend him as entertainment for any party. If you are looking for something different — This is it! You were a big smash at your grand opening and people in the office are still talking about your balloon twisting this morning. Everyone loved you, your balloons characters, and your personality was a perfect fit with our group. Your interaction with the customer was awesome. When I hired “Magical Balloon-dude Dale” I expected to see the typical orange giraffe or pink poodle with he pon-pom tail. I was amazed to see the beautiful “works of art” he created from balloons. The audiences enjoyed chatting with him as he made their personally chosen characters from balloons.